“I am now 57 years old,” says Sunil. “And that was the most dramatic experience I ever had.” The Nepalese is talking about 25 April last year, when the earth shook Nepal. Nearly 9,000 people were killed. 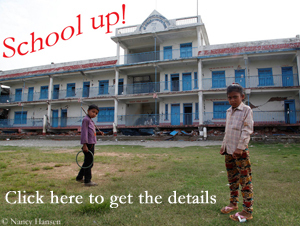 Then Sunil was among 2,500 guests of an event in a hall in the capital Kathmandu.”Suddenly the whole building began to shake. All people hurried towards the exit, which was much too small for this sudden rush”, Sunil recalls. “The people fell over each other, there was a panic. I thought there’s no point, I have to stay inside. If I will not survive, so be it.” The hall withstood the tremors. Sunil escaped with a fright. Life in Kathmandu now feels almost like always: chaotic, loud, colorful. But it is apparent that significantly fewer tourists are in town than usual. In the airplane that I used there were only about a dozen tourists, except them only Nepalese guest workers from the Gulf region. Never before I received my visa at the airport as quickly as this time: no queues at the officer’s desks. After only ten minutes I stood at the baggage carousel. Also Thamel, the main tourist district of the capital, appears at lunch time as if it was after the closing hour. A few backpackers get lost in the small streets. How on earth should all the shopkeepers make ends meet? 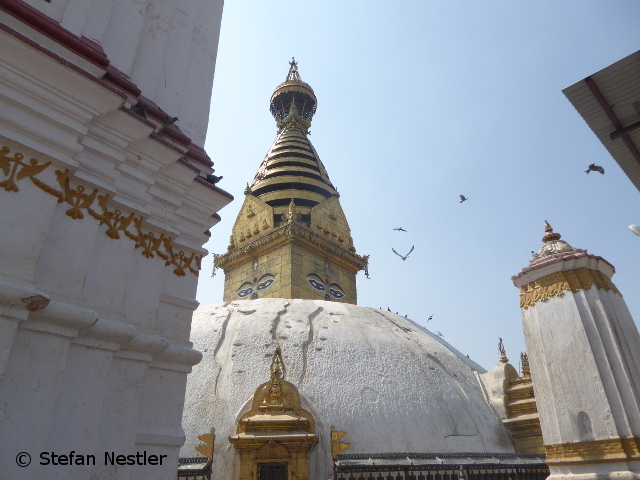 Up in Swayambhunath, one of the oldest Buddhist temples worldwide, some debris still testify the quake nearly a year ago. “A monastery building collapsed. Six construction workers, who were doing their job there, had just gone to lunch,” says one of the self-appointed tourist guides on the temple hill, who try to get a few rupees tip by any visitor from abroad. “One of the workers did not want to join his collegues. 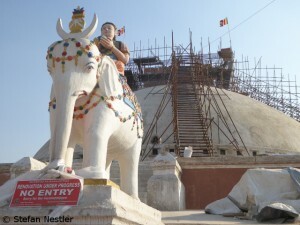 He died in the rubble.” The center of the temple complex, the Buddhist stupa, remained intact. Only one of the two Hindu towers on its side collapsed. At the other end of the city, the stupa in Boudhanath, a UNESCO World Heritage, was hit worse. The complete top with the striking eyes of Bhudda broke off. The reconstruction has begun recently. 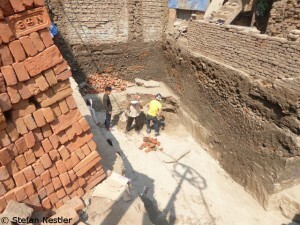 Generally, there is a lot of construction works in Kathmandu. The earthquake damage is to be eliminated as quickly as possible so that the tourists return. Finally, the Himalayan state depends primarily on tourism. According to official figures, last year one third less tourists came to Nepal than 2014. In truth the tourism market has collapsed much more clearly, almost everyone in Kathmandu with whom I talking about this topic is saying.